Rene Magritte, The Treachery of Images, 1928-9, oil on canvas. "C’est n’est pas une pipe." You might be saying to yourself, this is definitely a pipe. However he meant it to be read in a literal sense. The piece of work is not a pipe; it’s an image of a pipe. You can’t use the pipe to smoke tobacco with nor can you actually pick it up in your hands. It’s a representation, image, façade. 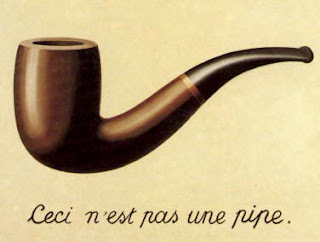 By this, Magritte was questioning the “standard” rules and stigmas of society with a simple statement about a pipe. He evokes further thought in a social context with an image that did not need a descriptive statement to begin with. By challenging what most would assume to be a pipe, the artist questions what is real and what is simply a mirage. This isn’t just referring to the inanimate but can also be applied to the society as a whole. In a world surrounded by people who say one thing and mean something else, act one way when they act another way around someone else, promise with empty promises and cave in to what’s the norm when that is simply not who they are, is a daily struggle for me to wrap my head around. Magritte had this same struggle and almost made a parody of it with this image. His artistic skill is also notable. What makes the message behind the piece articulate is his accuracy in painting. The pipe looks real and has this sort of commercial feel as well. Magritte’s artistic skill and technique is definitely up to par with his social activism. The Treachery of Images goes along with this idea that art is more than something good to look at. Art acts as a social message, that is very effective in conveying a message in a non-intrusive medium. You can choose to see behind the image of the pipe or simply take the image for its face value. Either way, there are always two ways to look at the world. Accept what you see or question it.